The essential guide to kaizen—the art of making great and lasting change through small, steady steps—is now in paperback. 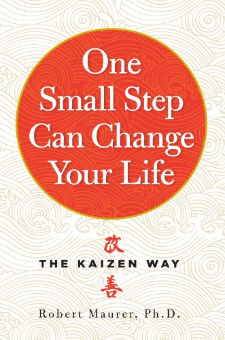 Written by Dr. Robert Maurer, a psychologist on the staff of both the University of Washington School of Medicine and Santa Monica UCLA Medical Center, and an expert on kaizen who speaks and consults nationally, One Small Step Can Change Your Life is the gentle but potent way to effect change. It is for anyone who wants to lose weight. Or quit smoking. Or write a novel, start an exercise program, get out of debt, or conquer shyness and meet new people. Beginning by outlining the all-important role that fear plays in every type of change—and kaizen’s ability to neutralize it by circumventing the brain’s built-in resistance to new behavior—Dr. Maurer then explains the 7 Small Steps: how to Think Small Thoughts, Take Small Actions, Solve Small Problems, and more. He shows how to perform mind sculpture—visualizing virtual change so that real change comes more naturally. Why small rewards lead to big returns by internalizing motivation. How great discoveries are made by paying attention to the little details most of us overlook. Rooted in the two-thousand-year-old wisdom of the Tao Te Ching—“The journey of a thousand miles begins with a single step”—here is the way to change your life without fear, without failure, and to begin a new, easy regimen of continuous improvement.